Lately, lots of influencers, writers and bloggers advise readers to retire early. But does that really make sense? Is early retirement the holy grail of the modern age? 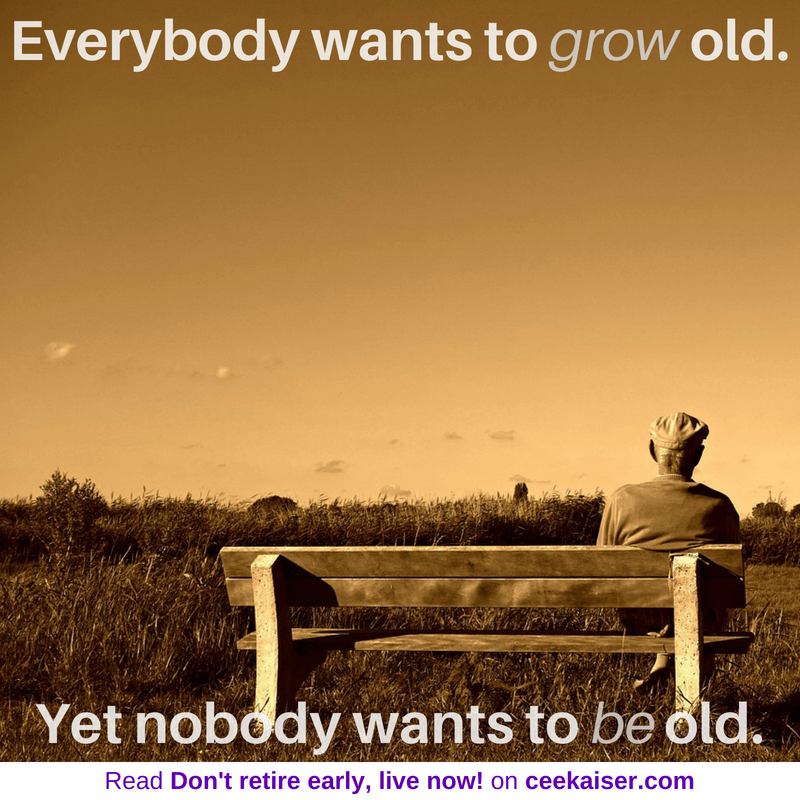 What would you do if you retired early? And what will the world around you be like once you retire? Lots of questions – lots of answers. Read on! Lately lots of folks are talking about their plans to retire early, when they are 40 or 50, the latest. So they put their noses to the grindstone. They work their asses off. And they save every single last penny they can find. And I can’t help but wonder: Why? 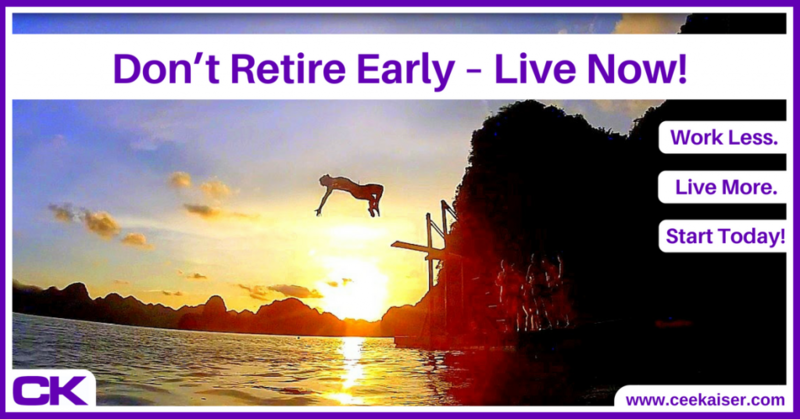 Contents of Do Not Retire Early – Live Now! Why Wait For Retirement? Examining it closely, the main difference between pre- and post-retirement seems to be ‘having a job’. Hence it could be concluded that people keen to retire do not like their job, since ‘having a job’ is something they’d like to change. The question arises: Instead of hating your job, why not find a job you love? Instead of wishing for retirement to arrive, why not enjoy every day along the way, while doing something fulfilling? It surely is possible – and I’ll happily explain you the “How?” below . Who Knows How Long You Will Live? Without trying to sound too pessimistic, but who out there knows their dying day? I don’t. And most non-suicidal human beings don’t either. What if you work hard for the next 20 years, to then get hit by a stroke, a bus or a coconut? I guess all of us know people who passed away too early. And nobody can guarantee that we won’t join that club one day. Who Knows How Well You Will Age? Let’s be a little less pessimistic, and assume you survive your days of hard work. But do we know how we will survive? Most people aren’t as agile in their 50s as they were in their 20s. I’m confident I won’t be able to do backflips anymore in Halong Bay once I retire (cover image). The problem is: Everybody wants to grow old. Yet nobody wants to be old. The third question is: What will you do once you retired early? Travel, some say. Spend time with my family and friends, others comment. Nothing, some people’s eyes unveil. Nothing is not a feasible option. You’ll be bored to death within months, if not weeks. People need a purpose. That’s why billionaires like Bill Gates, Warren Buffet, Mark Zuckerberg or Elon Musk keep going. Judging from their bank statements they could retire any minute. They don’t. Regards all other statements: What holds you back from doing any of these things now? This week, this month, this year? Why not cut back on your working hours, free up time and create the life you are dreaming of today? You have heard the story about the successful businessman going to Chile, haven’t you? Fact is: Your parents won’t get younger. And your kids won’t be small forever. Your friends may or may not stick around. 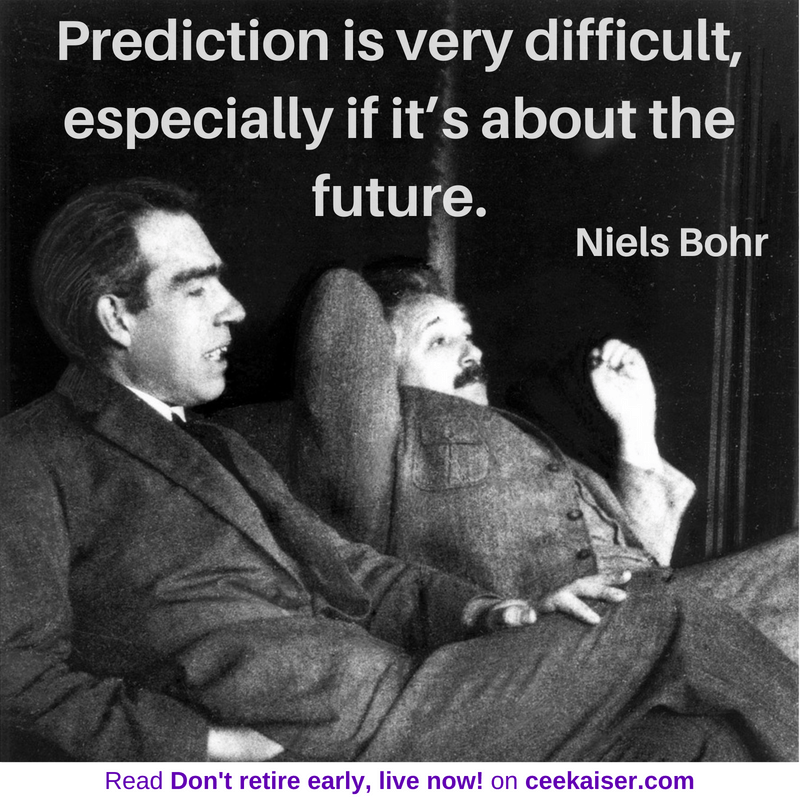 You can’t predict the future, and neither should you try. But you can start living the life of your dreams right now. What Will Our Planet Look Like When You Retire? Global warming, increasing world population, wars & crisis, plastic islands twice the size of Texas, overfishing, terrorism and animal species in danger of extinction, just to name a few, are all indications that life on planet Earth will be very different in 20 years’ time to what it currently is. If you ask elderly people, they’ll as happily tell you about ‘the good, old times’, as you will tell the generations to come. So why wait until we’ll talk about the stories we wish we could have told? Why not create everlasting memories while we are young, and wild, and free? There will never be a better moment to live than now. Even the bold dude said so. “There are only two days in the year that nothing can be done. One is called Yesterday and the other is called Tomorrow. After turning 18 and finishing my A-Levels, I went straight to Australia. Other side of the world, as far away from Germany as I could get (bar New Zealand). I took great pride in financing this trip myself, having worked as bartender, in call centers and distributing ad magazines and all. To make my euros stretch as far as possible, I slept on floors, shared a mattress in a campervan with up to 4 other persons (terrific fun! Thanks guys!) and ate the cheapest food I could find (rice with tomato sauce does taste quite okay, actually). I sneaked into house parties for some free food, did several cash-in-hand gigs, ditched parking violation tickets by telling cops wrong addresses and did a couple more not exactly legal things to save a few dollars. It was an incredible time. Now, having turned 30, I oftentimes still enjoy the backpacker mentality, but usually mixed with some grown-up trains of thought. I don’t mind good (and at least half-nutritious) meals, try to shop greener to save the planet, prefer to travel with people I already know and not to lie to cops anymore. Sometimes, deep down, I wish I could still be as carefree as I was back in 2006, but I can’t. Deep down I occasionally wish I had done even more crazy stuff back then. But I didn’t. My current attitude will change again over the upcoming years. And when looking back, I will wish that I could be as carefree again as I will then judge my current self to be. In ten years’ time I will still enjoy my life (touch wood), but it will be in very different ways. Living now is a challenge. And challenges are intimidating. 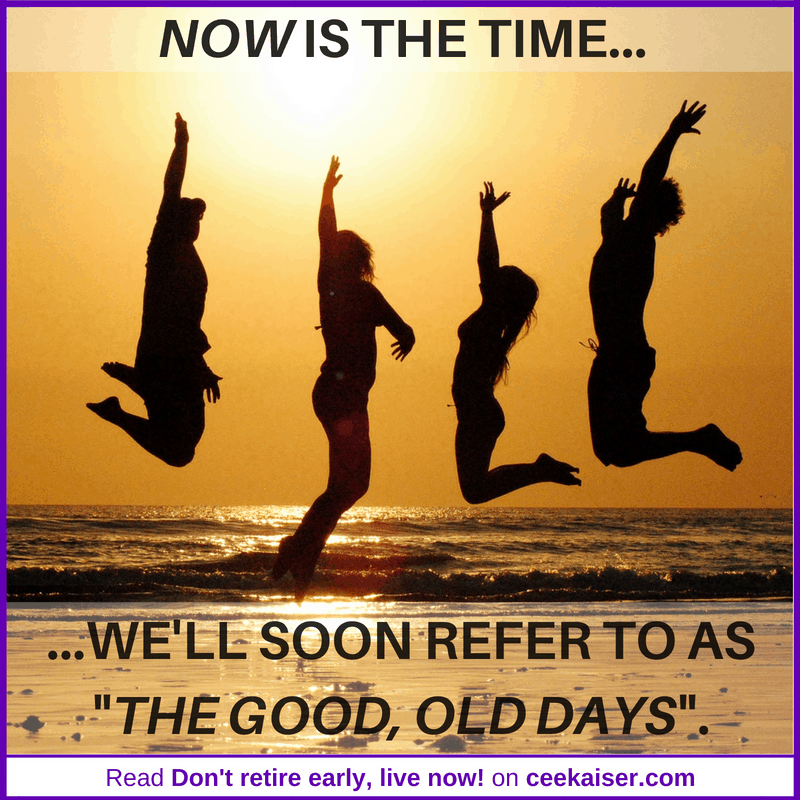 Procrastinating ‘the good life’ until you retire is so much easier. Today one can keep following the same old routine, dreaming about all the wonderful things you will do in 10 years’ time. In 10 years’ time life will be better. Last year, I decided to make a change. I told my boss I want to cut my working hours in half, from six days a week down to three days a week. He agreed. I also negotiated to relocate to Germany, to be closer to my family and the majority of my friends. Done deal. Now I work from home, or from any other place with internet connection and phone signal. I work 12 days a month, and hence have 16-19 days a month to do whatever I want. I spend more time with my parents, visiting my friends, traveling around Europe and the world, reading a good book or just sitting on my bum in the park doing absolutely nothing but enjoying the sunshine on my face and listening to song birds. And yes, I do it without the slightest hint of feeling guilty or pressured to do anything else. It is magnificent. The part-time salary is enough to support my travels, pay for food, keep this website alive and allow me to play around with other projects I’m interested in. Believe it or not – I’m even saving a good part of my salary. I don’t know how old I’ll get, but should I be lucky enough to have a couple of years to come, it’d be great to not live off BBQs I never got invited to. No, it isn’t. These websites are my passion projects and are very dear to my heart. I only work on them whenever I feel like it, and I hardly monetize any of my sites. There is no ‘one-fits-all’ solution to cutting back on working hours today and living more. You have to find your own solution here. My best advice is to dare sharing your desires with your boss. Whether it is more money, more time off, working from home or a promotion it is you desire – ask for it! How is your boss to know what you want unless you tell her? Chances are she’ll be keen to find a solution that works for both sides. I have managed teams of various sizes myself. And unless you work for McDonald’s, where new employees are up to speed within a few hours, most bosses hate letting people go. It requires them to look for new talents, interview and train them. A good boss rather focuses all this time and energy on growing her business instead. In case you really cannot find an agreement, leave. There are plenty of companies out there in dire need of a wonderful person like you, so no need to stick around where you are not appreciated. Since I started working at the age of 13, I’ve never been out of a job for longer than a month whilst seriously looking for one. Surely you can find your next gig even quicker than that. Alternatively, you can always opt to become your own boss. Start a website and offer your talent to the world. Here’s how to create a website in 2 simple steps – or simply outsource this task. In case you are your own boss already, calculate which of your projects pay the most, and ditch the unprofitable ones. You surely have heard of the pareto principle (aka 80/20 rule), haven’t you? It’s true. Share your thoughts and fears in our Facebook convo on Living in the moment with like-minded people. It’s the best way to realizing your dreams. In the end, it will have to be you taking the step. Trust me – it is worth it. Don’t be one of those people who never lived. No matter whether you retire early or never. Before we have too many priests rocking up for service, let me clarify this: I’m not saying you shouldn’t think about the future at all. I don’t smoke (tobacco), I considerably cut back on alcohol consumption, I don’t drink and drive anymore, I use sunscreen (yes, use sunscreen! ), do sports to keep fit, attend preventive medical checkups, I save money and work on my karma balance. I even floss! After all, we might get old. And if I do, I’ll still want to live for the moment there and then. And I want to be capable of doing it. I still want to be fit and active and full of joie de vivre. And I want to live on a healthy planet enabling me to do so. If I do get old, I want to read this article again, one last time, thinking: Yes, boy, you lived your life to the fullest. Every single day of it. Well done.